Geosite and Discovery Point	Doolin Pier	set against the rugged Atlantic Ocean and surrounded by the spectacular bare limestone landscape of the Burren. 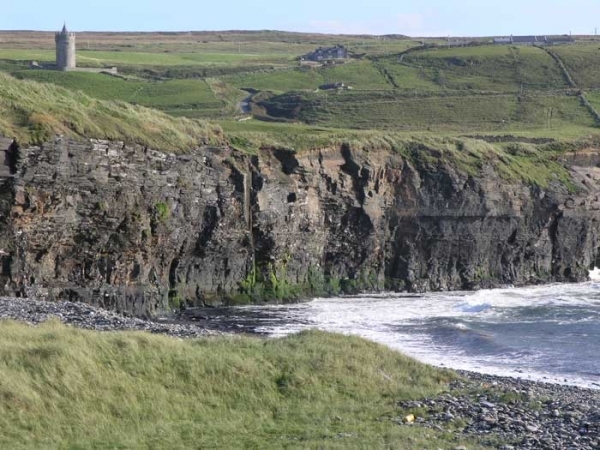 This discovery and embarkation point is in close proximity to Doolin village, a popular tourist destination. Ferries to the Aran Islands run daily throughout the summer from Doolin Pier. From here you can also take a cruise sround the Cliffs of Moher. At the pier you can walk on the limestone pavement and explore rock pools. Nearby is the busy village of Doolin famous for its traditional Irish music. Doolin pier is situated close to the geological boundary between the limestones which make up most of the Burren and the sandstones and shales which dominate the south and west of County Clare. 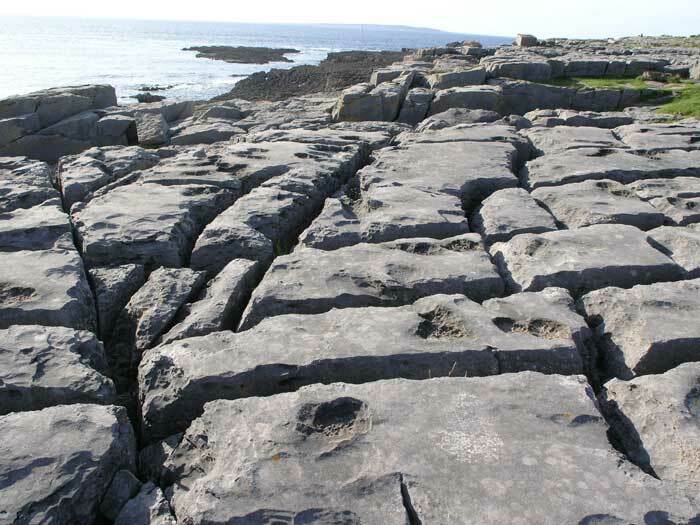 The limestone at Doolin pier is part of the youngest limestone in the Burren known as the Slievenaglasha Formation. It is packed with fossils, the most common of which are crinoids. On a freshly broken rock surface you will see sparkles as the light reflects off the calcite crystals that make up the stalks of these sea creatures. These creatures lived in a shallow sea close to the equator that would have been subject to storms and tides which would have broken up and redistributed the remains of the animals once they had died. 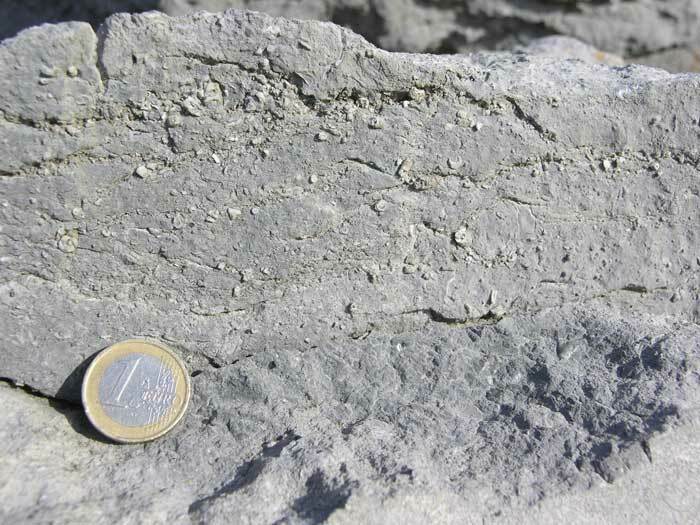 As these fossils accumulated on the sea floor and got buried they would have eventually been turned to limestone. Looking at the dark cliffs to the south it is easy to see that they are made of different rock. They belong to the younger Central Clare Group which is dominated by shales and sandstones. The change from limestone to shale and sandstone is evidence of a major change of environment at this time, around 320 million years ago. Black pieces of shale eroded from these cliffs often contain fossils known as goniatites. Goniatites were a type of free swimming, shelled mollusc. They are now extinct but are related to the chambered Nautilus which lives in the Pacific Ocean. Crab Island, which lies just offshore from the pier, clearly shows the inclined layers of limestone and how they are tilted to the south; this gentle tilting is actually the result of two continents colliding in what is now Europe, around 300 million years ago. The ruins on the island are the remains of a 19th C coastguard hut. At Doolin point there is a complex of hidden underwater caves known as ‘The Green Holes of Doolin’. These caves were formed by the same processes of rainwater dissolution which are acting on the Burren today and which formed all the numerous caves in the Burren, however these coastal caves were formed at a time when sea level was much lower than it is today and they have been drowned as sea level rose following the melting of the ice sheets at the end of the last ice age around 15,000 years ago.